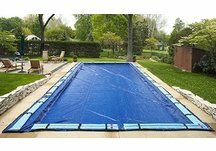 Pool Cover Source offers winter pool covers for in-ground and above ground pools! When you protect your pool this winter, you'll be glad you did next spring! We carry solid winter covers and mesh winter covers for your convenience. 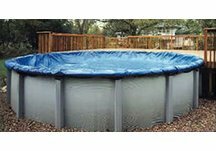 Our solid winter pool covers are made from tough polyethylene fabric with reinforced seams that won't rip, fray or come apart! They are also double stitched with water, chemical and sun resistant thread and feature rust-resistant aluminum grommets. Our rugged mesh winter pool covers make spring clean-up a snap. The secret to this unique cover is the tightly woven scrim that holds together ensuring that no gaps or holes develop. Rugged mesh allows only rain water and very fine silt to pass through. Since the cover is made of mesh that is very lightweight, simply lift it off in the spring. No heavy water to lift off or time consuming cover pumping. 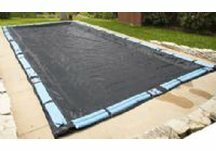 Simply remove the rugged mesh, vacuum up the fine silt and open your pool!